If you were to ride Old 70 through the town of Black Mountain, you would see a single grey placard (the kind that usually memorialize Civil War battle sites) stating: “BLACK MOUNTAIN COLLEGE Est. in 1933; closed 1956. Experimental school with emphasis on fine arts & progressive education. Campus was 3 mi. NW.” With exception to that one sign, there are no other monuments or physical reference to the college. You could drive down many long winding roads, as I did, and find no mention of its existence either at Lake Eden or on the campus of the YMCA Blue Ridge Assembly. Within the Art World, Black Mountain College has an emerging legacy tied to New York luminaries, collaborative life-as-art teaching strategies, and the transition from Continental European avant-garde to American. 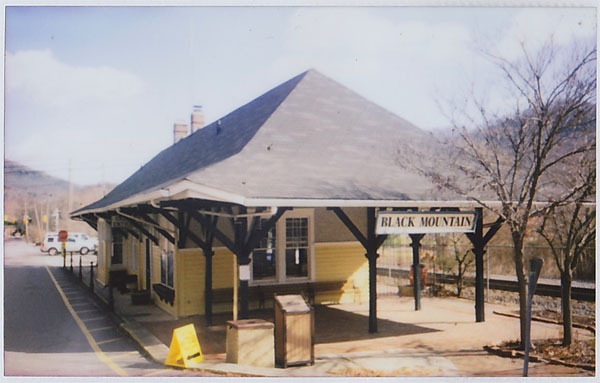 Inside the Town of Black Mountain, the college is rarely mentioned, and remains an unspoken sub layer of local history. At the Blue Ridge Assembly, you can drive right up to the porch of Lee Hall, where great white columns still stand and rocking chairs look out over the Seven Sisters. To your right, the former College Hall (now named Heaton Hall) that housed the BMC students from 1933-41 looks as if it were from another time; ancient wood siding, whole-log support beams, and over 400 layers of whitewash. At the Lake Eden Campus, currently Camp Rockmont (a Christian summer camp for boys), you could drive past the lake and park beside the Gropius-Breuer designed Studies Building; Charlot’s pair of murals quietly fading into their functional supports for the camp’s office. Over by the lake, a small loose square of poured concrete provides a hint to the site’s creative past. 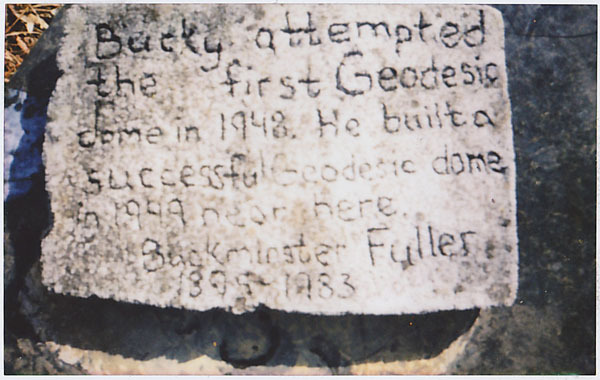 Scribed into the surface of the once wet concrete, reads: “Bucky attempted the first Geodesic dome in 1948. He built a successful dome in 1949 near here. Buckminster Fuller 1895 – 1983.” This folk relief lies flat on the earth and reminds us of a Do It Yourself headstone. In a world of iconic personalities and constructed culture, here lies the site. Little thought is given to the spirit of the land. The earth is paved over, cities built, and institutions established. Information has been digitized and is accessible to 43% of world population. In this current existential dilemma, let us not forget the importance of physical location. A site can provide grounding, space, community, and identity. Following the Situationist concept of psychogeography (the specific effects of the geographical environment on the emotions and behaviors of individuals), the remote pastoral setting of the college was an important catalyst for this kind of artistic innovation. Black Mountain College could not have happened just anywhere. Maybe the lack of monuments and plaques documenting the legacy of Black Mountain College is a good thing. Monuments are made to commemorate people or events that serve as important touchstones for history. This means that Black Mountain College is not yet history; that we are still living in its wake, that the ship has not yet passed. Maybe this town that was so important to the Pre-New York Art World, will be just as important to the Post-New York Art World. Maybe the sites themselves have as much to do with innovation as the people.